Step 1: Every Problem Has a Solution!! WARNING:THE PROJECT DEALS WITH 230 VOLTS AC POWER. IMPROPER OR INCORRECT USE CAN CAUSE DEATH OR INJURIES AND PHYSICAL DAMAGE TO APPLIANCES. PROPER CARE AND PROTECTION MUST BE EMPLOYED BEFORE WORKING ON THIS PROJECT. The hardware involves Power Electronics at its core and Digital electronics at the front-end. 2.4 inch TFT touch panel. Power electronics performs the main job of switching CoolMOS C7 while the Digital electronics forms a user interface.Thus meeting the problem statement we have stated, that is providing isolation from lethal power. MOSFET are uni-directional semiconductor switches and are very well known to work with DC power. Almost every household devices operate on AC power. We know the advents of AC power and is altogether a different discussion, the question that is of prime concern is, "Can we employ MOSFET's with AC Power?" Step 1: Every Problem Has a Solution!!! As shown in the schematic, the MOSFET is connected to the output of Bridge Rectifier with an AC load in series with one of the Line input to the Bridge Rectifier. We can control AC home appliances with MOSFET. NOTE 1: The MOSFET still sees a DC Voltage. Whenever the CoolMOS C7 MOSFET is switched on, the bridge rectifier draws current from the AC source and the drives the load respectively. NOTE 2: Do not connect mains supply (230V, 50Hz In India) directly to the Bridge rectifier if you are using IN4007 Diodes. That is why I have made use of 2 transformers. This transformer(Auxiliary transformer) is not necessary if you can find diodes with high power tolerance. A step down transformer is used to step down 230 V to 12 V AC which is then passed through the Bridge Rectifier and filtering capacitor. At the output we receive around 14V DC which is fed to Linear Voltage Regulator LM7805 and LM7812 IC. LM7805 provides regulated 5V which will be used to control the MCU(Micro Controller Unit) LM7812 provides regulated 12V which will be used by the Gate Drive Circuit. This project will comprise of two stage Gate Drive circuit. CoolMOS C7 has Gate Threshold voltage as 3V (min). For stage 1 gate drive, 5V DC will be applied across gate and source which is generated by ArduinoUNO (Refer Step # to learn how). Drain is connected to +12V of the LM7812 voltage regulator IC and source is connected to common ground of both micro-controller and the system. Now we will utilize the Drain to Source voltage controlled by Microcontroller driven stage 1 gate drive to turn on CoolMOS C7 controlling the AC load. To turn on CoolMOS properly, 12 volts Gate to Source voltage should be good enough. But this gate drive voltage must be isolated. This is achieved by using the XL6009E1 DC-DC Boost Converter and IK1212SA Isolated DC-DC Converter. By doing so we have isolated stage 1 and stage 2 Gate Drive circuit and coupled them through Power Isolation. The stage 2 CoolMOS is the one which behaves as a switch having control over driving the AC Load and this CoolMOS C7 of stage 2 receives Gate pulse through stage 1 CoolMOS C7 switching. Now that we have successfully built the gate driver for our CoolMOS C7. We will now work on the user interface. For this we will be using the 2.4 Inch TFT LCD SPFD5408 With ArduinoUno,through which we will design graphics indicating ON and OFF keys to set up our Flat Panel Switchboard. 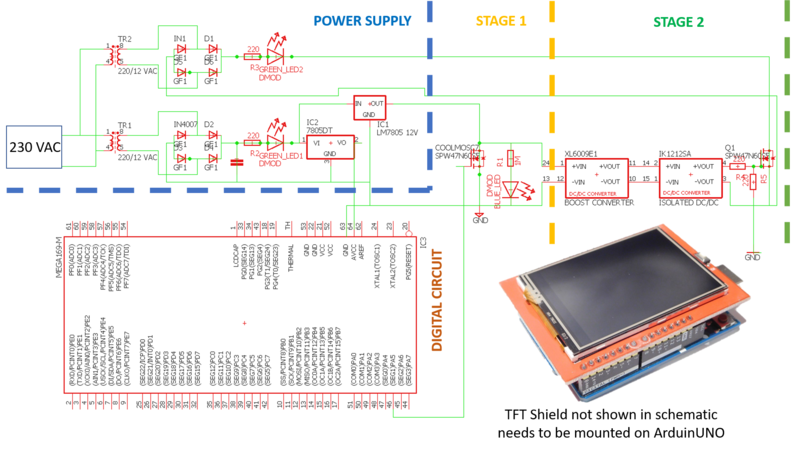 This TFT Shield when mounted on AduinoUNO, we use Analog Pin A5 which is set to LOGIC 1 when user touches ON and LOGIC 0 when OFF is touched. This LOGIC controls the CoolMOS C7 in stage 2 gate drive circuit correspondingly. Applying 220 VAC across the diode in the bridge rectifier will burn them dead as it did in my case. Therefore I have used Auxiliary Transformer (not needed if your diodes can tolerate high power rating). I have used 220-230V, 50Hz 0.5W Philips Bulb running on auxiliary transformer secondary rated at 12 VAC 0.5A 50Hz, thus the bulb glows very dim in the video. Flat Panel Switchboard with CoolMOS C7 technology. The circuit contradicts the very fact of smaller footprint , just because there has been a delay from the manufacturer to deliver my customized PCB. So i had to go on submitting with my prototype circuit.